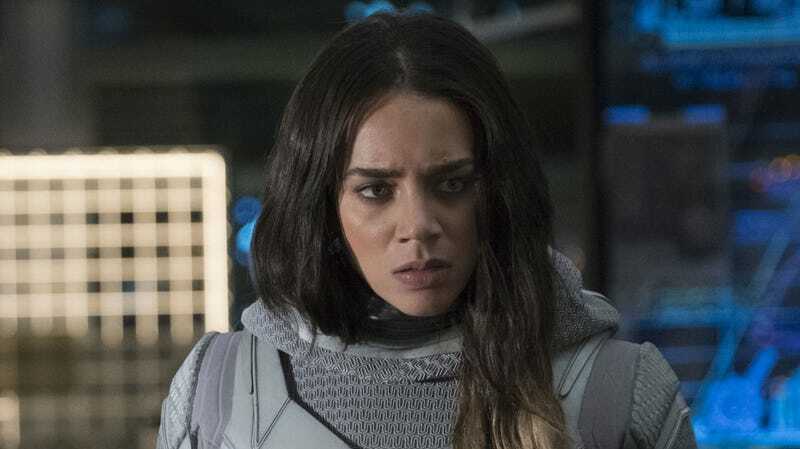 Hannah John-Kamen as the Ghost in Ant-Man and the Wasp. Most superheroes come prepackaged. Comic book history has long dictated their origins, powers, and adversaries, and most superhero movies simply follow suit. A rare exception comes in the form of Ant-Man and the Wasp’s villain. The character’s origins are muddy and their powers are rather malleable. So director Peyton Reed used those mysteries to craft a mostly new villain perfectly suited to his film. That villain is the Ghost and, in the comics, he’s a mysterious hacker with a powerful suit that lets him teleport things, move through matter, and shoot people. The movie version borrows a few of those traits, but for the most part, it’s a reinvention, starting with the casting of Killjoys actress Hannah John-Kamen and extending all the way down the line. The tone was important but a strong integration into the story was the real key. In Ant-Man and the Wasp, Ghost’s origin dates back to when she was just a little girl named Ava. Ava’s father worked with Hank Pym’s technology and had a terrible accident. The accident killed her father and gave her the incredible power to move through objects. However, those powers are painful and potentially deadly. Visually, Ghost is close to its comic book origins. By tying Ghost’s origin directly to Hank’s Quantum research, it gave the character a direct conflict with the heroes as well as a complex emotional core. She has to steal Pym’s lab before it’s too late and she dies. An obstacle for the filmmakers was this: If you have this character with these largely undefined visual powers, what exactly do they look like? Finding the answer was a process. If you’ve seen the movie, you know eventually it did work. The Ghost’s effects are among the most impressive visuals we’ve seen in a Marvel Cinematic Universe movie to date, especially one based on Earth. That realism was a key to getting the effects right. In a universe of characters who are well-defined even before they make it to the big screen, Ghost is not at all annoying. She’s fascinating.